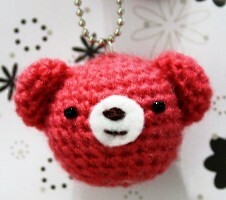 A super sweet little bear face for your keychain. It'll make you smile every time you lock the door! Thanks for sharing this pattern; he's really cute and I want to make one for myself tonight! Hi, I just created a ninja chick pattern on my website. Could you please put it on your website? Thanks! çok güzel örgüler şirin şeyler..sizin blogu örgülerinizi beğenerek takipdeyim..sevgiler. to be honest, i've been kind of sick again with my CFS & do plan to get back into updating here again.